I've seen good reviews about this book and even my friends told me to read it soon so when I was about to start reading it, I saw my inbox from Rockstar Book Tours, from there I decided to join right away and I am so glad to be part of this. It is my first time to read a Kara Thomas book (I knooow I haven't read Darkest Corners yet and I am sorry for that, I promise I will!). Anyway, Little Monsters? WOW. I enjoyed reading it so much and I managed to squeeze the reading time and work, I read it during break time if I could because putting it down is hard. I already have clues what will happen at the end but I really want to know how twisted the story is. So many clues, so many people involved but who really is the killer? that is what the reader needs to find out. The book isn't hard to read though, it is puzzling a little but as you understand the story and the POVs of both Kacey and Bailey, everything will be in place. The characters are the typical teenagers who badly want to be the center of attention. Kacey, the new girl in town and she have two step siblings, Lauren and Andrew. When she moved in, every thing just changed around her without her noticing until the time when the murder of Bailey Hammond happened. Jade and Bailey are Kacey's best friends, the girls are inseparable but then some thing happened that ruined their friendship and this is also the cause why Bailey is missing. Every one blames Kacey and her brother Andrew but something doesn't matched. Will the detectives find the reason of the murder? Will they find the real murder? I leave it to all the readers. Right now, I could say that this book is a must read! Little Monsters just brought my reading energy back. I'm glad I am still sane after reading this (ROLF). AND before I end this, can I just say I love the cover??? I honestly thought it was a horror story at first, sorry about that but I love it for real. Kara is the author of the critically acclaimed THE DARKEST CORNERS. 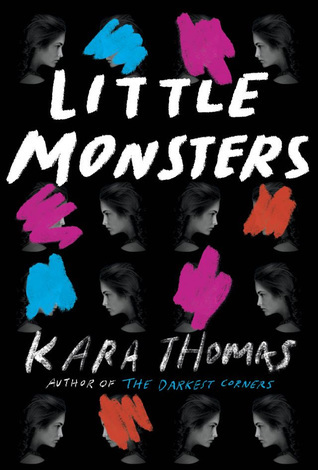 Her new book, LITTLE MONSTERS, is coming July 25th from Random House/Delacorte. She’s written for everything from her high school newspaper to Warner Brothers Television. You can find her on Long Island, bingeing on true crime podcasts and TV shows.